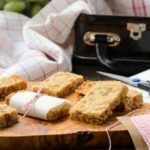 A recipe for honey oat bars. The bars are made with quick cooking oats, honey, and are filled with butterscotch chips. They are a great snack for any time. Whisk together the flour, salt, and cinnamon in a bowl. Stir in the oats. Beat butter, honey, and vanilla in a large bowl until creamy using a hand mixer on high speed. Add flour/oat mixture and stir or beat on low speed to combine. Press evenly in an ungreased 13- X 9-inch baking pan. *You can substitute chocolate chips or dried fruit for the butterscotch chips.